Looking back on the week, I feel like I’ve hardly done any cooking. Or else I’ve just done a lot of quick, boring meals. We had a couple of social events over the past week that involved food, so that was a couple of meals out of my hands. In related news, my 21-Day Sugar Detox was pretty badly derailed by meals out where it was hard to control the food I was eating. Feeling pretty bummed about it, but at least the vast majority of what I ate was 21DSD-legit. I’m just going to extend it to 30 days to make up for the laxness of this first week. I was cruising through the blogs I follow on wordpress the other day, and came across this simple, brilliant idea from 365 Days of Bacon: Bacon Kale Chips. How had I never thought of this before?? Brilliant. I whipped up a batch and scarfed them down greedily. Another handy 21DSD snack: these Coconut Flour Muffins from Balanced Bites. I tweaked them a bit by adding unsweetened coconut flakes and 100% cocoa unsweetened chocolate chips, and topping each one with a bit of flake sea salt. The salt really worked, making up for the complete lack of sweetness in the muffins themselves. Pretty yummy, although a little alarming if you’re expecting a sweet chocolaty muffin. Will try to be more attentive to this blog and cooking in general over the coming week! Emily maybe you could tell me exactly how you make your kale chips? 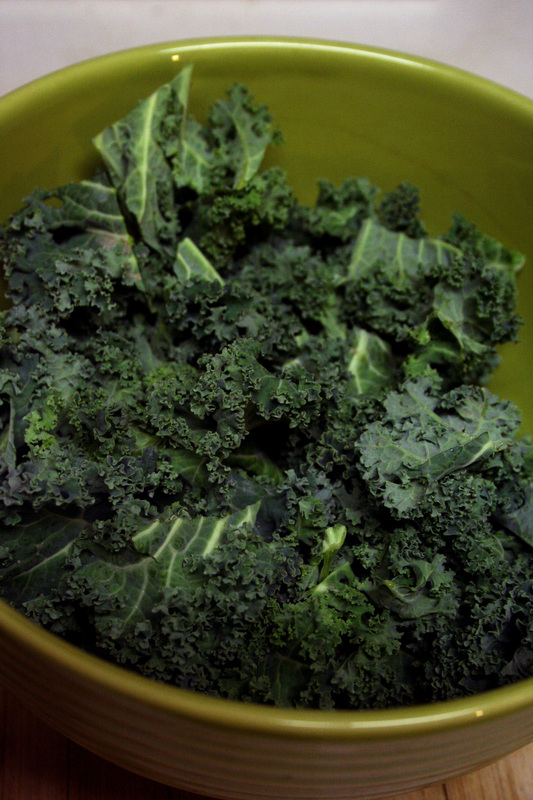 You take a head of kale, wash and dry it, and then cut off bite-sized pieces of the leaves (just remove the central stems, they’re too tough). Toss them in a bowl with fat (melted bacon grease, or butter, or coconut oil, or olive oil) and then spread out in a single layer on a foil-lined baking sheet. Sprinkle with salt and bake at 250 for a little under an hour.